In this paper I shall try to clarify Husserl’s conception of time-consciousness. In particular, I try to explain what exactly the asymmetry between protention and retention consists in. I argue (i) that Rodemeyer’s understanding of the protention-retention relationship, as developed, seems misleading, mainly for two reasons: first, it does not take into account that the ‘now’ has duration; second, she conceives the relation between protention and retention as symmetric, (ii) that the asymmetry between protention and retention could be better understood if we could not only take into account the influence that retention and affect have on protention, but also if we could take into consideration the conceptual difference between surprise and disappointment. This difference, I suggest, reveals new ways to understand the protention-retention asymmetry. Blattner, W. (1999). Heidegger’s Temporal Idealism. New York: Cambridge University Press. Brough, J. B. (1993), “Husserl and the Deconstruction of Time,” Review of Metaphysics 46 (March 1993): 503-536. Brough, J. B. (1972), “The Emergence of Absolute Consciousness in Husserl’s Early Writings on Time-Consciousness.” Man and World. Brough, J. B. (2002), “Time and the One and the Many (In Husserl’s Bernaur Manuscripts on Time Consciousness),” Philosophy Today 46:5 (2002): 14-153. Brough, J. B. (1991), “Translator’s Introduction.” In E. Husserl, On the Phenomenology of the Consciousness of Internal Time (1893-1917). Trans. by J. Brough. Dordrecht: Kluwer Academic Publishers. Dalhstrom, D. (1994), “Heidegger’s Critique of Husserl.” In Reading Heidegger from the Start: Essays in His Earliest Thought. Edited by T. Kisiel and J. van Buren. Albany: State University of New York Press. Dan Z. (2010), “Inner (Time-)Consciousness”, in Lohmar, I. and Yamaguchi (eds. ), On Time - New Contributions to the Husserlian Phenomenology of Time, Phaenomenologica 197, DOI 10.1007/978-90-481-8766-9_1, C Springer Science+Business Media B.V.
Dastur, F. (2000), “Phenomenology of the Event: Waiting and Surprise”, Hypatia- Volume 15, Number 4, Fall 2000, pp. 178-18. Evans, J. C. (1990), “The Myth of Absolute Consciousness.” In Crises in Continental Philosophy. Edited by A Dallery, et. al. Albany: State University of New York Press..
Held, K. (1966). Lebendige Gegenwart. The Hague: Martinus Nijhoff. Kelly, M. (2005), “On the Mind’s ‘Pronouncement’ of Time: Aristotle, Augustine and Husserl on Time-consciousness.Proceedings of the American Catholic Philosophical Association. Macann, C. (1991) . Presence and Coincidence. Dordrecht: Kluwer Academic Publishers. Richardson, W. (1967). Heidegger: Through Phenomenology to Thought. The Hague: Martinus Nijhoff. 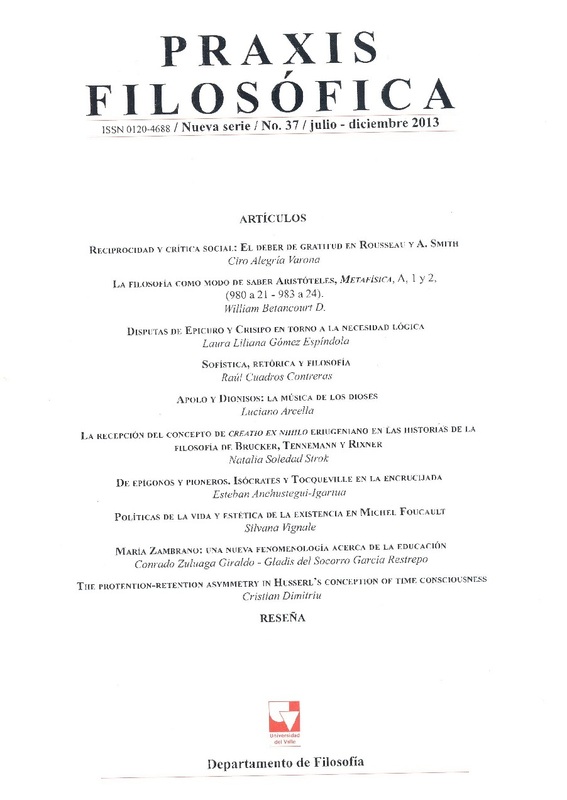 Rodemeyer, L. (2003), “Developments in the Theory of Time-Consciousness: An Análisis of Protention”, in Welton, Donn, ed. The New Husserl: A Critical Reader. Bloomington : Indiana University Press. Rudolf B. (2010), “Husserl’s New Phenomenology of time consciousness in the Bernau Manuscripts” in Lohmar, I. and Yamaguchi (eds. ), On Time - New Contributions to the Husserlian Phenomenology of Time, Phaenomenologica 197, DOI 10.1007/978-90-481-8766-9_1, C Springer Science+Business Media B.V.
Sallis, J. (1971), “Time, Subjectivity and the Phenomenology of Perception.” The Modern Schoolman XLVIII (May 1971): 343-357. Shaun. (1998). The Inordinance of Time. Northwestern University Press. Sokolowski, R. (1974). Husserlian Meditations. Evanston: Northwestern University Press. Sokolowski, R. (2000). Introduction to Phenomenology. New York: Cambridge University Press. Varela and Depraz, (2007), “At the Source of Time: Valence and the constitutional dynamics of affect”. Thompson, Evan. Mind in Life: Biology, Phenomenology, and the Sciences of the Mind. Varela, F. (1999), “The specious present: The neurophenomenology of time consciousness”, in: J. Petitot, F. J. Varela, B. Pachoud and J.-M. Roy (Eds. ),Naturalizing Phenomenolog: Current issues in phenomenology and cognitive science, Stanford University Press. W. James. “The Principles of Psychology”, page 1 (http://psychclassics.yorku.ca/James/Principles/prin15.htm). Welton, D. (1999), The Essential Husserl: Basic Writings in Trascendental Phenomenology. Bloomington, Ind. : Indiana University Press, Chapter 11. Wood, D. (1989). The Deconstruction of Time. Atlantic Highlands: Humanities Press International. Zahavi, D. (2003).Husserl’s Phenomenology. Palo Alto: Stanford University Press, 2003. Zahavi, D. (1999). Self-awareness and Alterity: A Phenomenological investigation. Evanston: Northwestern University Press. Zahavi, D. (2003) , Husserl’s Phenomenology, Stanford: Stanford University Press.